The term wellness has become increasingly popular in the media. In the health and fitness industry, wellness is considered synonymous with optimal health and well-being. Interestingly, no one comes into the gym with the stated purpose of improving wellness. Maybe that’s because wellness has not been well defined. Or, perhaps it’s because wellness is so complex. What are we working on when our goal is wellness? According to Dr. Charles B. Corbin, a professor in the department of Exercise and Wellness at Arizona State University, wellness is defined as “a multidimensional state of being describing the existence of positive health in an individual as exemplified by quality of life and a sense of well-being.” Two key ideas: multidimensional and positive or optimal health. Wellness is multidimensional. In fact, experts have defined not one, not two, but six dimensions of wellness! 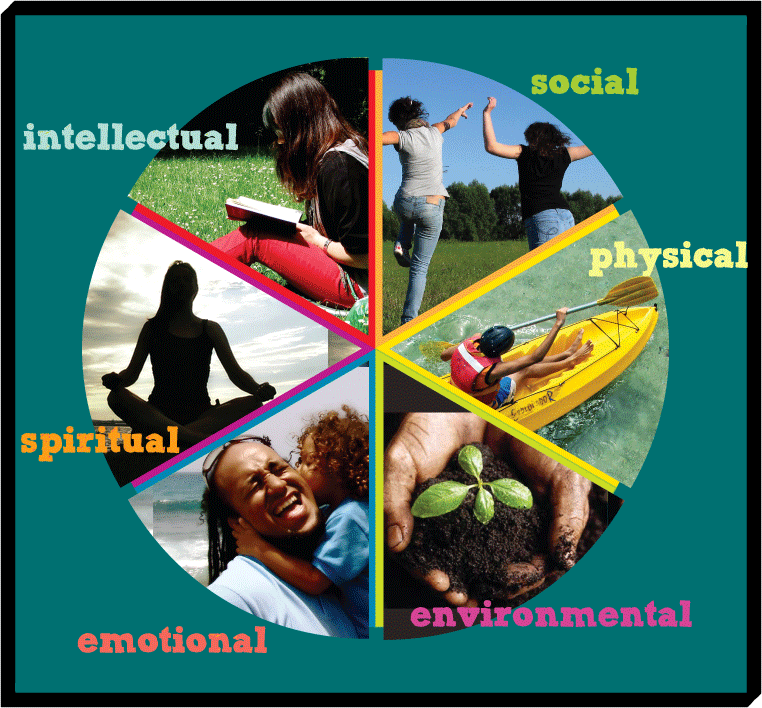 All six dimensions are interrelated and work together to yield greater quality of life and sense of well-being. Therefore, attention must be paid to each of the six dimensions to attain positive health. • Physical wellness – is not just over all health or the absence of disease, but includes nutrition, level of fitness, and the ability to care for oneself. • Emotional wellness – is the ability to understand and deal with emotions, as well as the ability to share feelings in a healthy and meaningful manor. For example, identifying triggers for stress, managing anger, monitoring reactions, and finding appropriate responses to situations. • Intellectual wellness – is the ability to constantly challenge our minds. Intellectual wellness requires life long learning, and seeking out new experiences and challenges. Additional examples include being open to new ideas, and developing the capacity to question and think critically. • Interpersonal/Social wellness – is the ability to develop and maintain satisfying and supportive relationships. Social wellness also requires participation in and contribution to our community, country, and world. Additional forms of interpersonal/social wellness include developing good communication skills, and having the capacity for intimacy. • Spiritual wellness – is not limited to an affiliation with religious organizations, rather it is the sense of belonging to something greater than oneself, and includes a set of guiding beliefs, principles or values that provide purpose and meaning to life. • Environmental wellness – refers to livable surroundings, and includes the degree of violence and hazards in the environment. For example, the availability of clean natural resources, exposure to crime and domestic violence, as well as abusive behaviors all affect environmental wellness. Interestingly, the six dimensions of wellness are reflected in Buettner’s suggested guidelines for longevity. For example, physical wellness is reflected in the recommendations to move, cut calories, and make good food choices. Spiritual wellness is represented in the idea of having purpose in one’s life and a believe system to support spiritual growth; and interpersonal wellness resonates with the ideas of belonging and putting loved ones first. Positive health and vitality are largely determined by our choices. When we start to make lifestyle changes that allow us to reach our optimal potential, we are working on wellness. The key is balance. All the dimensions of wellness are interrelated, for example a healthy diet will positively affect our ability to be more physically active, and managing stress will improve interpersonal relationships as well as physical health. This means that improvement is not only possible; it is an essential part of the continuing journey toward a long, happy and healthy life. Fahey, Insel, & Roth. (2009). Fit & Well. New York: McGraw-Hill.